I've had LinuxMint LXDE 10 installed on my little EeePC 901 for some time but, quite honestly, I rarely used it. Part of the reason for this is that LinuxMint never appeared anymore to me than Ubuntu in a different color although it does have some differences but, in my view, nothing noteworthy. In addition, I didn't see anything in LXDE that I liked. Anyway, a few days ago Katya became available so I decided to upgrade what I had to Katya as I really do like the "new" Ubuntu with the Unity launcher. I first tried to upgrade what I had to Katya using the command as detailed here. However, I never got past the apt-get dist-upgrade command which consistently errored out when trying to install the 2-6-38-8-generic kernel. No idea why but I didn't hang around to find out. Instead, I downloaded the iso in Ubuntu on my desktop and used the usb-creator to burn the iso to a 1GB usb key. This is a great tool and works easily, even easier the Unetbootin, if that's possible. Well, this was a surprise. But, as usual, I wasn't the first to have experienced this problem and this thread features a good discussion. Most importantly, a very easy solution is provided which worked perfectly for me. At the boot: prompt that shows up on boot just type "live" (without quotes) and it should boot up perfectly, as it did for me. Installation of LinuxMint 11 was troublefree. To get the desktop I wanted, I had to install unity, chromium-browser, conky, conkyforecast, conkyemail amd emerald. Now, choosing the Gnome session on login gave me 3D effect and the Unity launcher essentially just as I already have in Ubuntu on the same machine. However, emerald did not work. Running "emerald --replace" in a terminal gave me a segfault. Once again, however, this is a known problem as outlined here. -- I had to start conky with a script including a 20 second sleep to avoid conky launching in a window that stayed "on top". -- I also had to start emerald with a script containing "emerald --replace" preceded by a 10 second sleep. 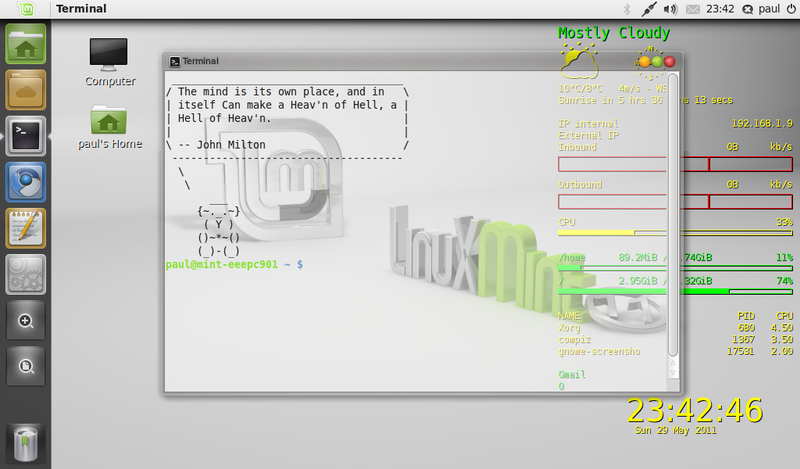 Now LinuxMint looks great an is highly usable. But once again, it really is no different from Ubuntu other than being of a different color. Maybe, this time, I'll see what all the fuss is about.